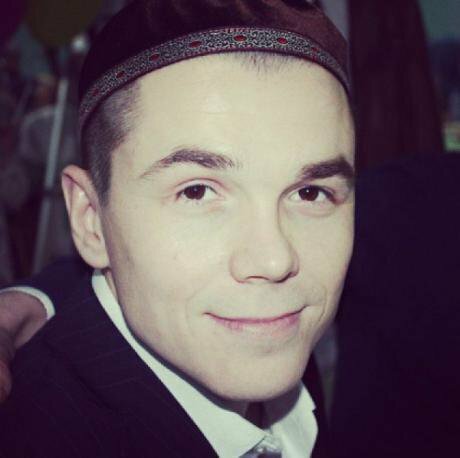 Another trial against Russian “Islamists” results in harsh convictions – this time, 21 of them. Illustration: anastasia vikulova. Source: OVD-Info. All rights reserved. This article was originally published in Russian by OVD-Info. In late July, a court in Ufa, capital of Bashkortostan, reached a final ruling in one of the largest cases concerning the Islamist party Hizb ut-Tahrir in recent years. Alleged and real members of the organisation, which is banned in Russia, have been targeted consistently over the past 15 years: since 2003, there were at least 50 trials concerning Hizb ut-Tahrir – and no less than 300 people have been convicted (mostly in Tatarstan and Bashkortostan) as a result. On this occasion, some 21 people were sentenced to between five and 24 years imprisonment. According to the investigation, the crimes of these men included reading certain books, as well as holding meetings and discussions about Islam. The defendants were charged under two articles of Russia’s Criminal Code: on terrorist organisations and on attempts to overthrow the constitutional order. OVD-Info spoke with those present at the trial and specialists on Islamist movements. 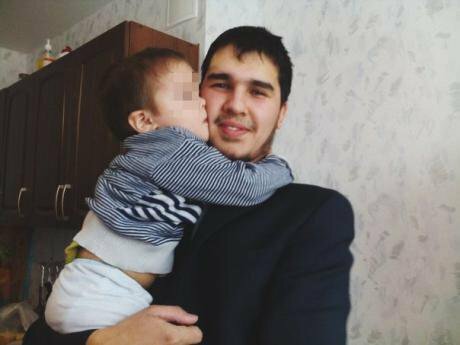 Rinat Nurlygayanov, 27, received the longest sentence – 24 years imprisonment. Before his arrest, Nurlygayanov repaired household appliances, helped out at his local mosque and arranged charity football matches for residents of Ufa’s poorest districts. His mother Milyausha Nurlygayanova, a public defender, recalled how her son was tortured in February 2015. The case against Nurlygayanov and the other 20 men arose as a result of a 2012 extremism investigation into four Ufa residents – Aydar Garifyanov, Yevgeny Kulagin, Rasim Satpayev, and Alexey Khamadeyev – who were charged with setting up a Hizb ut-Tahrir group. In the course of the investigation, Russian law enforcement carried out searches of many homes, and dozens more people became suspects under Article 282.2 of Russia’s Criminal Code (on membership of an extremist organisation), including eight of the suspects who were recently sentenced. Rinat Nurlygayanov. Source: Human Rights Center Memorial. In September 2014, investigators declared these eight men were wanted by the authorities – a fact the suspects themselves only discovered in February 2015 when they were arrested as part of a group of 23 men. Three of them, Denis Statsenko, Aynur Klysov and Ayrat Ibragimov, escaped detention and are now in hiding. 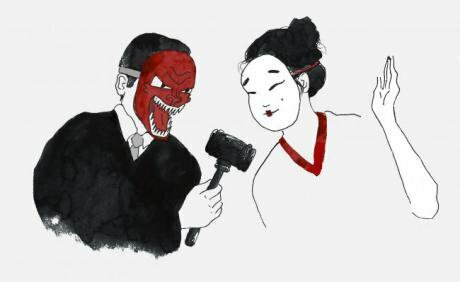 The new accusations, on the same grounds, were filed on a different charge: article 205.5 (participation in a terrorist organisation). Both cases were dealt with by the same department of Bashkortostan FSB. By June 2016, a further eight people were under investigation in two parallel cases. Rinat Mamayev and Rinat Gataullin, who pleaded guilty, were convicted in March 2017 to four years imprisonment. If Korepanov, the head of the investigation team, is to be believed, on 15 June 2016 at Ufa FSB, the eight defendants agreed to the closure of the case against them under Article 282.2. On the back of the order to terminate the criminal case, investigator Korepanov wrote that the accused had given their assent. The defendants state that they did not give their consent to the termination of the case, neither verbally nor in writing. Furthermore, they state that they only discovered the existence of the order to close the case at trial. At the request of their defence counsel, the entry and exit logs of the detention centre where the men had been kept were checked. According to the Russian Federal Penitentiary Service’s records, the prisoners were not taken to meetings with investigators. It should be noted that closing a criminal investigation without the accused being present is a procedural violation – and that falsifying investigation documents is a criminal offence. The public defender for Denis Fayzrakhmanov, who asked not to be named, stated that investigator Korepanov was in no hurry to carry out an investigation: while suspects in the case were detained in February 2015, investigators only set to work on 1 August. Literature allegedly seized during searches of the defendants’ homes was handed over to the investigators only in December. The defendants deny keeping any prohibited material at home. 7 April 2017: the final day the defendants had to read the charges and evidence against them. But on that day, they discovered that two volumes (80 and 81) of the case files had gone missing. By this time, most of the accused had only managed to read a third of the case files – though Rinat Nurlygayanov, for example, managed to study 78 volumes. Two offices at the detention centre were crammed with nearly as many lawyers. One of the offices was nearly half-full of case materials. With only 23 seats, many had to study the documents standing. According to Fayzrakhmanov’s lawyer, after the two missing volumes were eventually recovered, they were found to unexpectedly contain the confessions of one of the defendants, Khalil Mustafin. He claims that the files did not contain his confession before they went missing – not least, Mustafin stresses, because he never made such confessions and insists on his innocence. Other defendants who were able to examine these volumes before they went missing make similar statements. Khalil Mustafin is a martial arts champion. He worked as a domestic appliancetechnician, and received 22 years in prison. “The investigator recovered these volumes the following way,” says Fayzrakhmanov’s lawyer. “He allegedly discovered files including transcriptions of Mustafin’s interrogation on his computer. He then printed out the drafts, stamped them, then added his signature and the words ‘verified copy.’” Mustafin’s former lawyer Diana Miyassarova, who was not defending him at the time, also confirms these events. Among the documents were testimonies implicating not only Mustafin, but several other participants of the case. At the beginning of the investigation Miyassarova was appointed Mustafina’s lawyer, but he stopped working with her in 2016. After the case was handed over to the court system, the defendants immediately requested additional time to familiarise themselves with the evidence against them. The volumes again began to appear in the detention centre once again. On 21 September 2017, the defendants stated in court that staff at the detention centre had informed them that two more volumes (139 and 180) had been lost. Judge Oleg Semyonov sent a request to the detention centre, which responded that the case materials had been transferred to the investigator. On 28 September, the court declared that volumes containing details of searches of the defendants’ houses had been lost. As for the volume containing the investigators’ interrogations, Fayzrakhmanov’s lawyer believes that it met much the same fate. Investigators submitted poorly-scanned transcripts of these interrogations to the court, again bearing the words “verified copy”. During questioning at court, many defendants began to declare that they had never given the evidence recorded in the transcripts, and that the signatures were not theirs. Six or seven witnesses distanced themselves entirely from the interrogation transcripts, rejecting the testimonies they had allegedly given to investigators. According to Fayzrakhmanov’s lawyer, it was now impossible to conduct a handwriting examination due to the lack of original documents. According to a verdict of the Volga district military court, in 2010 a cell of the Islamist party Hizb-ut-Tahrir began to meet in Bashkortostan. Between 2010 and 2013, Nurlygayanov and other defendants joined the group. In the opinion of the investigation and the court, the primary reason for the organisation’s existence was the “elimination of non-Islamic governments… and the foundation of a worldwide Islamic caliphate.” The contribution of the accused to this goal was to hold clandestine religious and political study sessions, recruiting new adherents and collecting funds. Moreover, the defendants were accused of organising conferences and attending rallies to propagate the teachings of Hizb ut-Tahrir. With the exception of Aramis Fazylov, none of the accused admitted their guilt. Many of them were not acquainted with one another before their detention. These acts were classified under sections one and two of Article 205.5 of Russia’s Criminal Code (on the organisation of and participation in activities of a terrorist organisation), as well as Article 278 and Article 30 (on attempts to overthrow the constitutional order). However, the court took into account the fact that the article on terrorist organisations (205.5) only appeared in the criminal code in November 2013 – hence none of the defendants could be prosecuted for acts committed before that date. Therefore the court qualified all the defendants’ alleged criminal acts before November 2013 under Article 282.2 (on extremist organisations), but dismissed the charges as the statute of limitations had expired. All actions of the accused since November 2013, in the court’s opinion, could be charged under Article 205.5. Milyausha Nurlygayanova says that the judge was not interested in allegations of torture. She says that her son and others tried to talk about their torture in the courtroom, but the judge stopped them, answering that such matters should have been addressed to the Ministry of Internal Affairs. “Don’t discuss that here,” the judge said, “that’s not within my remit.” The judge refused to field questions to officials or witnesses about the defendants’ torture. There also an incident of physical violence at court, says Nurlygayanova. One of the guards insulted Farid Mustafayev: “I’ll cut your balls off.” As he had stood up for Farid, Rinat was dragged away to the guards’ quarters along with him. “Then the guard grabbed Rinat by the scruff of the neck, threw him into a cage and gave him several electric shocks. Rinat lost consciousness. They called an ambulance and he was taken to the emergency ward. Doctors recorded his injuries and even gave us documentation, but there were no consequences for anybody,” recalls Rinat’s mother. According to Fayzrakhmanov’s lawyer, judge Semyonov behaved rudely and without any restraint. He berated the defence, telling them to watch their tone, and constantly interrupted the defendants and witnesses. He constantly threatened lawyers that he would lodge a statement about their conduct with Russia’s bar association. 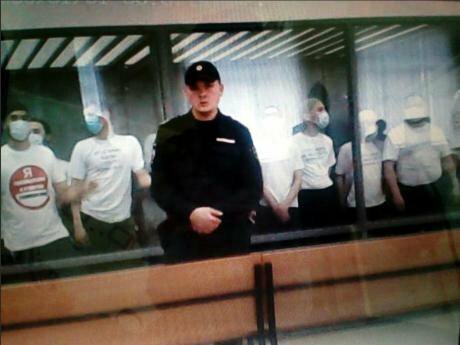 In April, several dozen cadets from the Ministry of the Interior attended one of the court hearings. They arrived late, and entered the courtroom after the session had begun. Usually when a spectator tried to enter a the courtroom late, judge Semyonov would stop them, hector them, and then throw them out. “The courtroom is not a tram you can hop on and off!” he would shout. But Semyonov said nothing to the cadets. The defendants tried to point out this inconsistency, but Semyonov replied that he would only allow them to speak after he had heard a witness’s testimony. Nurlygayanov asked permission to speak. Semyonov glanced at his secretary and asked “Cadets? Do you see any cadets here?” The secretary replied that he could not. Judge Semyonov agreed. Defendants stage an action wearing t-shirts "I'm a Muslim and I'm against terrorism" in court. Image provided via OVD-Info. Regardless of the defendants’ preferences, and the easy availability of lawyers to represent them, the judge appointed several “understudies” as legal counsels. If a lawyer was not present at the courtroom, even with good reason and with prior agreement, one of the “understudies” would stand in for them in court, and the trial would continue. Consequently, situations arose where one understudy would be present for the first half of a witness’s interrogation, and after everybody had returned from lunch, a different understudy would arrive to take his place. Fayzrakhmanov’s lawyer says that the lawyers filed separate complains on the court’s “buffer zone”. When these complaints were discussed at court, a representative of the guards said that they had been unable to allow the lawyers access to their clients for security reasons. Yet in further instances at court, the guards declared that they had allowed such access. Milyausha Nurlygayanova believes that her son was given the longest sentence because he most actively defended everybody during the trial. In the opinion of the defendants and their legal counsels, the length of sentences depended on behaviour in court, and not on the sum of evidence presented. In the words of Fayzrakhmanov’s lawyer, those who received 22 years’ imprisonment or more were those who most actively defended their innocence. Muslims whom law enforcement agencies consider to be members of Hizb ut-Tahrir have been targeted in Russia since 2003, when the Supreme Court pronounced the group a terrorist organisation. Criminal cases are launched on charges of membership, not on the basis of committed or planned terrorist acts. In his analysis of Hizb ut-Tahrir’s activities, Alexander Verkhovsky, head of the Sova Centre for Information and Analysis, notes that there were no grounds for recognising the organisation as a terrorist group. The Russian Supreme Court’s decision to do so made no mention of acts of terrorism committed by Hizb ut-Tahrir members. Verkhovsky also points out that the organisation’s tendency towards anti-Semitism and aggressive rhetoric against Israel could be sufficient grounds to characterise it as extremist, but not necessarily terrorist. Hizb ut-Tahrir al-Islami, or the “Party of Islamic Liberation,” emerged in the early 1950s in east Jerusalem. The party appeared in the political context of a growing anti-colonial movement and the foundation of the State of Israel, which was perceived in the Arab world as a manifestation of western imperialism. The Palestinian branch of the Muslim Brotherhood party formed the core of the organisation.